So you’ve done your research on Radiant Pools and now you’re prepared to go to the next stage and figure out just what it will cost you. The problem is most pool retailers may give you a price on a specific size and won’t necessarily tell you installed pricing (both above ground pools and in-ground pools), unless you come into the store to discuss. So what’s the big mystery? It can feel a bit like visiting a used car dealership at times! At E-Z Test Pool Supplies we want to take the mystery out of the process and just give you the pricing up-front so you can know exactly what you’re in for when it comes to pricing. I know…weird huh? We’re like that. 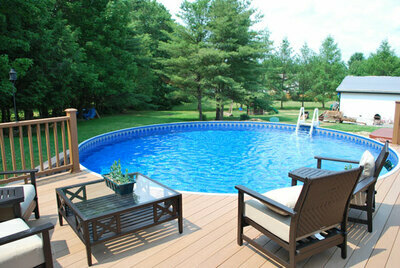 If you’ve been researching this you are finding out just how beautiful, versatile, and rugged Radiant Pools are. Structural Integrity - Two outer layers of acrylic coated aluminum sandwiched over a 2” core of EPS (expanded polystyrene) form a composite structure that is stronger than 12 inches of concrete. This really is the last pool you’ll ever need to buy. Limitless Installation Options – Can be installed above ground, fully in-ground, or semi-in-ground (even with one side in-ground and the other wall fully or partially exposed. Fully Transferable Lifetime Warranty – This pool’s design is so durable and so rugged that Radiant offers a full lifetime warranty that can be passed on even if you sell your pool after using it for years. Radiant Pools even offers coverage against winter damage – this is something that no other above ground pool manufacturer will do. Built In Heat Retention – The 2” expandable polystyrene (EPS) core not only contributes to the composite structure strength, but it also has the added benefit of retaining heat that is normally lost through the walls. This is huge if you’re going to be running a heater or heat pump! As you can see, if you’ve checked around on pricing, quality of product and installation you’ll see the savings and value in Radiant Pools, both in-ground and above ground. E-Z Test Pools also offers 18 month 0% interest through Wells Fargo Financing, so please be sure to contact us soon – 2019 pool season is just around the corner!